WonderHowTo favorite NurdRage once again triggers the inner mad scientist in all of us (well, all of us WonderHowTo-ians at least). 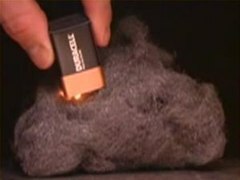 Below, watch what happens when steel wool- found in every common household Brillo Pad- is lit on fire. "Normally we do not think of iron as being flammable, this is because bulk iron doesn't self-sustain its burning like most flammable materials. But the strands of steel wool are thin enough with enough surface area that heat produced is self-sustaining and will continue to burn through if there is enough air present. To do this, simply pull apart and fluff up the steel wool to separate the strands. Then simply set it on fire. The steel wool should then burn flamelessly creating iron oxide. You can also use a 9-volt battery and short out the terminals across the steel wool, the resistive heating should be hot enough to start it lit." NurdRage Shatters Mysteriously Procured Human Heart. HowTo: Turn Your Piggy Bank to Gold. Good information but doesn't seem to have many uses. sorry if I double post here, but just off the top of my head I'd say it would come in handy as general survival knowledge (i.e. starting a campfire with some steel wool and 9volt battery) or as part of an ignition switch for some form of explosive. I haven't tried it for either use, but they both seem pretty plausible.